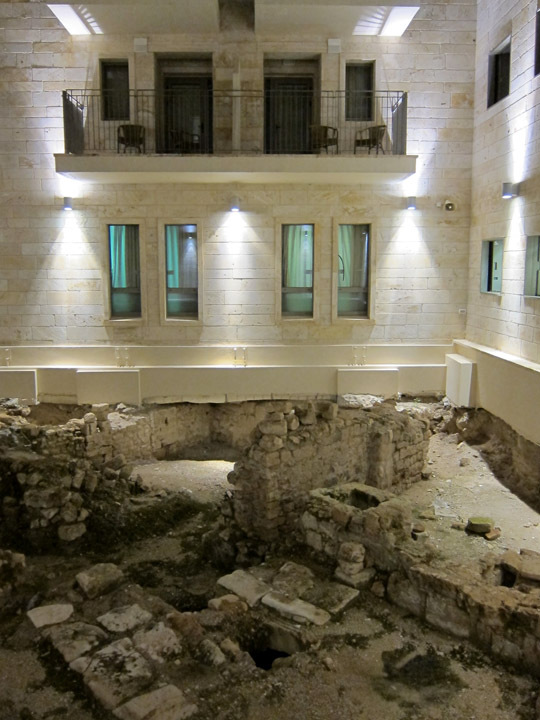 Rooms overlook a courtyard of domestic excavations at the Akko Youth Hostel. 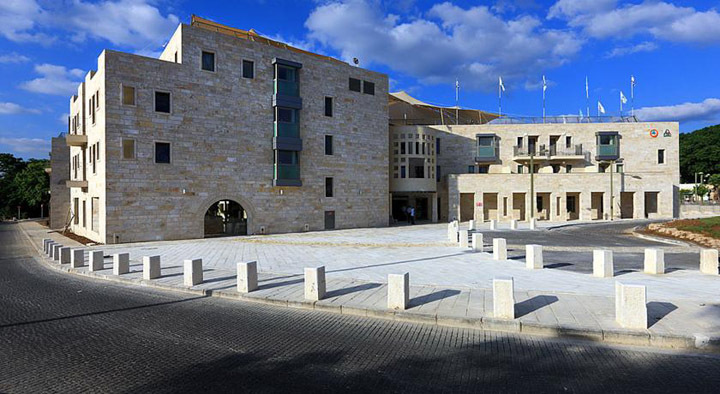 The Akko Knights Youth Hostel and Guest House is a modern facility that was constructed in such a way as to incorporate and exhibit the archaeological elements on site. 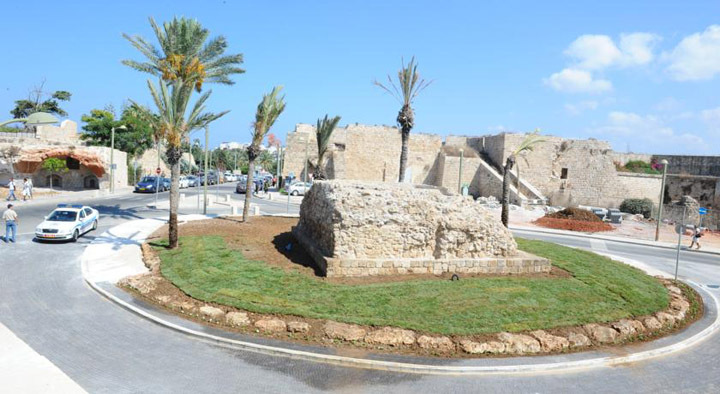 Located on the northern edge of the old Crusader city, this area contained a residential neighborhood in the 13th century. The foundations of several of these domestic dwellings are now part of a courtyard circled by rooms. A portion of an aqueduct cuts through the outdoor dining room. Equally impressive, a portion of an Ottoman era aqueduct from approximately the 16th century cuts through the outdoor dining area and continues into one of the indoor common areas. Upper section of a cellar. 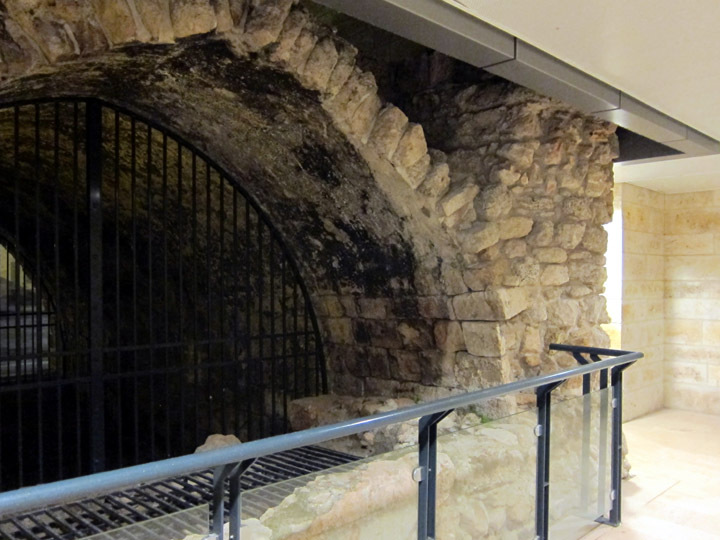 Exploring the hostel, we also found a massive storage cellar from the Crusader period and the foundation of an Ottoman tower gate in the green space just outside the reception area. Helpful informational boxes are located throughout the hostel and explain the ruins in detail. 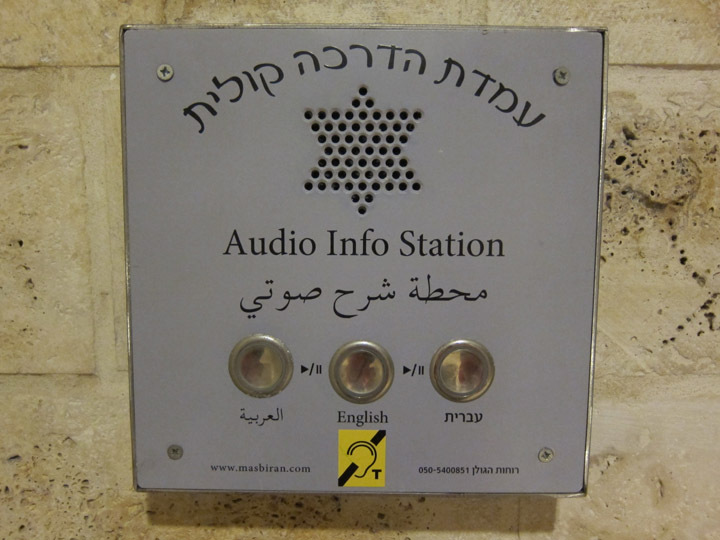 The hostel provided some signage for these and other historical elements incorporated into the facility, but what really impressed me though where the multilingual audio guides. These little boxes provided detailed information about the nearby ruins and the history of Acre. The archaeological elements were a great surprise and totally unexpected. This is characteristic of many places in Israel. There is an emphasis on and dedication to preserving and studying the numerous historical treasures of the country. As someone who travels for art and history, this was a delightful bonus. As a side note, I also have to thank the staff for being so helpful during our stay! They placed us in a quiet section with only other independent travelers, scattered the mob of 12 year-olds who had taken over the breakfast buffet, brought us special pastries at breakfast, and showed us how to use the espresso machine which was off limits to the kids! While they definitely welcome adult travelers, the hostel can get about 200-400 kids a night. With its own historical site essentially in the hostel lobby, you can see how this is a great place for students! Truly fascinating! I love the fact that they respect the history; embracing enough to incorporate the ruins into their design and provide helpful audio boxes for interested travelers in museum-like setting. I have never seen anything like it! I know, I’d never seen anything like this either! 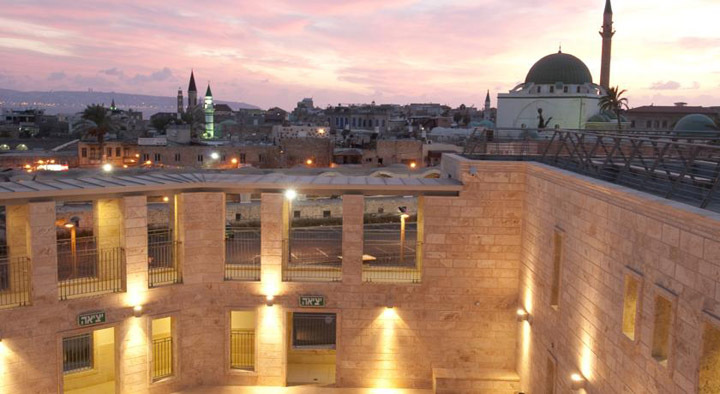 The design of the hostel was thought out and very conscious of the historical remains on the site. The audio boxes (which were all working incidentally) were a great touch! Wow! You had me at ‘Crusader era’. 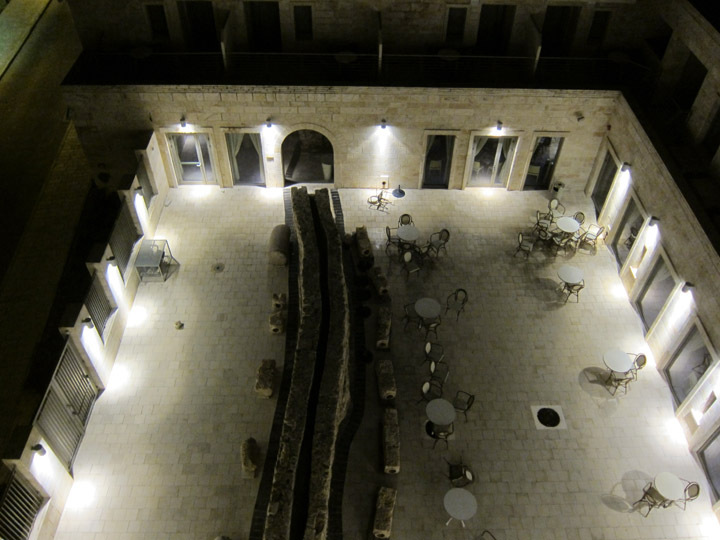 Having ruins on site just might persuade me to try a hostel again:)) Certainly would try this one!